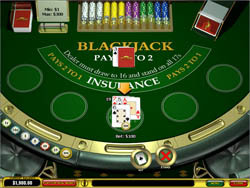 In Playtech’s Blackjack, the dealer stands on all 17s. Splitting is allowed, but you cannot re-split in this game. Split aces take only one more card before you must stand. If a split ace receives a 10 point card, the player gets 21, not blackjack. If you want to double down it is an option, even after a split, at a cost of 1x your initial bet. If you double down when the dealer shows an ace, and the dealer gets blackjack, you lose both your bets. But if you double down when the dealer shows a 10 point card and the dealer gets blackjack, you get your double down bet back! Insurance is available if the dealer shows an ace. You cannot surrender in this game. Playtech Blackjack can be a high stakes game if you like, as allowed bets range from 1 to 300 USD/GBP/Euro. Strangely, the chips come in six sizes – 0.01, 0.10, 1, 5, 10, 25, and 100. Why there are two chips less than 1 credit, which is the minimum bet, is not clear! At any rate, that does not change things much. When you win, blackjack pays at 3:2, a standard win at 1:1, and insurance pays at 2:1. Playtech’s Blackjack looks, well, amazing. It looks as though it’s all a photograph, from the plush velvet stools, the shining brass chip tray, and the plexiglas card shoes. The cards and chips are subtly animated, but everything moves quickly and smoothly, so these flourishes never get in the way of playing the game. As for gameplay, all is well. The buttons come and go on the bottom of the screen, only appearing when they are needed. There are even optional warning messages for beginners – the game asks ‘are you sure?’ if you try to hit on 17 or higher! This makes Playtech Blackjack a good game to learn with. Playtech Blackjack has a special winning hand called 10 Card Charlie. This is a hand with 10 cards in it – because you still can’t go over 21, these cards must be all 2’s, or it is possible to have nine 2’s and one 3. Either way, this hand beats all dealer hands except for blackjack. So if you find yourself in a strange streak of 2’s, keep hitting! This hand doesn’t come up often, but it sure helps when it does! Playtech Blackjack is a great game because it keeps things simple. It uses classic Vegas Strip rules with some minor exceptions, and because the game is so well designed, playing it is a breeze. This leaves you to focus on sharpening your skills and perfecting your strategies! Great for beginners and experts alike, Playtech Blackjack is definitely worth trying out.